Adam Blythe and Hannah Barnes won the elite road races at the 2016 British Cycling National Road Championships - the first time either of them have claimed the national champion's jersey in the road race. Blythe held off a sprint challenge from former world champion Mark Cavendish, while Barnes led a 1-2 family finish, with sister Alice taking second, and the under-23 title. The men's under-23 title was won by Tao Geoghegan Hart. Time trial champion Alex Dowsett (Movistar) was the first to launch a sustained attack, drawing out a 22 second lead at one stage, before being swallowed up by the peloton. There were repeated attacks in a frantic first couple of laps, but riders weren’t able to make them stick in the opening exchanges. Dowsett was active in a number of early attacks, but the first meaningful break came with eight laps of the main circuit to go. Josh Teasdale (Prorace Cycling Team), Alex Peters (Team Sky) and Kristian House (One Pro Cycling) were among a group of nine who broke away, building up a lead of 40 seconds at one stage. Other chasing groups attempted to bridge the gap, with two of them proving successful, the second of which included Mark Cavendish (Dimension Data), Tao Geoghegan Hart (Axeon Hagens Berman CT), Dowsett and Chris Latham (Team Wiggins), and caught the leaders with under three laps of the main circuit remaining. No sooner had Geoghegan Hart joined the leading group, then he had set off on a break, joined by JLT Condor’s Tom Moses, Tinkhoff’s Adam Blythe and Alex Peters, opening up a ten second lead with two laps remaining, extending it to just under a minute and a half. The leading four maintained a gap for the closing sections of the main circuit, but as riders headed into the city centre finishing circuit, they’d reduced it to just 25 seconds, with Cavendish driving hard. But the leaders were able to hold off the challenge for the first half of the finishing circuit, before fading in the closing stages. The catch was made with two laps to go – with rain starting to fall as riders entered their final lap. The stage was set for a big sprint finish – and it didn’t disappoint. Cavendish, always in contention for these finishes went head-to-head with Adam Blythe – with the Tinkoff rider coming out on top to take the win on the line and claim his first ever national road race title. Team Sky’s Andrew Fenn took third while the under-23 title went to Tao Geoghegan Hart. "I had to be super aggressive." "I wanted that one. All day I was thinking about it and always trying to be in the right move. With a couple of laps to go, I thought we might hold off the chase, it was hanging around 20 seconds, we did a few hard turns hoping they'd stay away but we came back together and I just gambled it would be a sprint and luckily I got round Cav. "It was a hard day. We were marked out all day, we weren't really given any room as such. We were always on the pedals all day, I've had one of the highest powers I've had all year so I was really happy and I think Mark's happy as well, sort of, for me!" "It's my first time as British champion and my partner Hannah won this morning so, to be honest it felt like I'd already won today before the race even started. I think in some ways, in a race like that, a little bit of the pressure off and I knew I had to be super aggressive after doing this race last year so, it paid off I think. It was a target, it's really special." Early on in the race, Drops Cycling’s Jennifer George attempted a break on the climb of Thorpe Thewles but couldn’t get it to stick. Moments later, Podium Ambition’s Dame Sarah Storey then charged ahead on a solo break, a gap that reached up to one minute and 20 seconds at one point on the second lap of the main circuit. With two laps of the main circuit to go, a group of 12 riders, led by Nikki Harris and Dani King drove to swallow up Storey’s lead, eventually catching her. The group then surged on to build up a 50-second lead over the main pack. As Storey tired and looked in danger of dropping away from the lead group, King attempted a solo attack – but was unable to make it stick as Storey found strength in reserve to return to the main pack. Entering the finishing circuit, the lead group had a healthy lead of 55 seconds – but the peloton, driven on by Nikki Juniper, gradually started clawing them in, reducing the gap by 25 seconds with one lap remaining. The lead group remained cagey – Canyon - SRAM's Hannah Barnes quickly attempted a break but King denied her the chance to stretch out a lead. 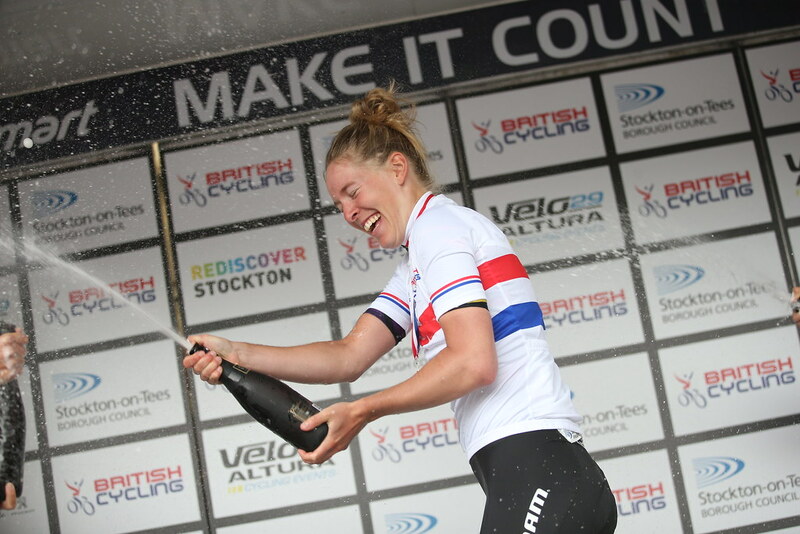 It all came down to a sprint finish in Stockton-on-Tees – and a battle of the Barnes sisters. Hannah – on crutches at the start of the season following injury – pipped younger sister Alice on the line to take the title for the first time – with Drops Cycling's Alice having to settle for second place and the under-23 title for the second year in a row. Lucy Garner of Wiggle High5 took third place in the elite race, alongside second in the under-23 race. "It feels really great. It was a really big aim for me this year. I think having the winter off, it was a realistic aim for me to focus on this race. (With Lizzie Armitstead not competing) it left the race pretty wide open. I'm really pleased to have the race win and how I could finish it off. "It's quite a fine line between being patient and making sure you go with the right moves. Thankfully it was a pretty small group that we got away so it was easiest to mark and go with the moves. Coming into the circuits it was pretty active and I had to make sure I was with everyone that went. "I didn't expect Alice to be so close to me really, I haven't raced with Alice in a long time so it was really nice to have her there. For her to have the under-23 jersey as well, we have a very happy mum and dad!"